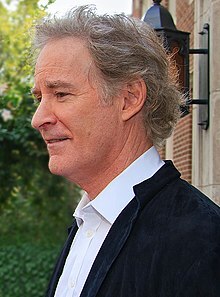 Kevin Delaney Kline (born October 24, 1947) is an American stage, television, voice, and movie actor. He has won a Academy Award and two Tony Awards. Kline was nominated for five Golden Globe Awards, two BAFTA Awards, and an Emmy Award. He is known for his role as Otto West in A Fish Called Wanda, as both President Mitchell and Dave in Dave, and as both Artemus "Artie" Gordon and President Ulysses S. Grant in the 1999 movie Wild Wild West. He is currently the voice of Mr. Fischoeder in Bob's Burgers. Kline was born in St. Louis, Missouri on October 24, 1947. He has been married to Phoebe Cates since 1989. They have two children. ↑ "Kevin Kline biography". filmreference. 2008. Retrieved June 7, 2008. This page was last changed on 14 February 2017, at 01:46.